Volatility in a bond portfolio can raise both consternation and eyebrows! The past five weeks remind us that bond prices can and will go down in price – after years of predominantly upward (only) movement. Laddered bond portfolios are the ideal structure for this environment. Rising rates improve the overall yield-to-maturity of each portfolio. Maturing bond proceeds reinvested at higher levels raises overall portfolio income. Bonds still absolutely make sense in a balanced portfolio. We view the rise in yields as a great buying opportunity. 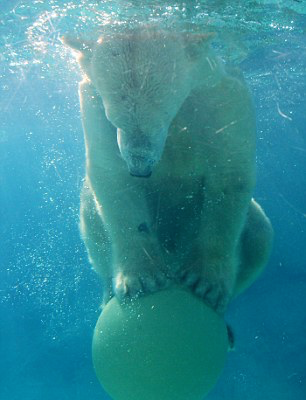 A beach ball held underwater wants to rise. Once released, it not only breaks the surface, but sails skyward before settling back down to drift upon the surface. I couldn’t help but use this analogy for what we are witnessing in the bond world. It’s too perfect and provides perspective. A dose of perspective is exactly what is needed right now – as bond portfolio returns move into negative territory for Q4 and we approach the close of 2016. The Federal Reserve has been one of the primary buyers of U.S. debt for years and has pushed the ‘yield beach ball’ deeper and deeper under water. This has resulted in arguably artificially low rates and corresponding artificially high bond prices. Trump’s victory caused bond investors to reassess the validity of historically low rates and low inflation expectations. This was enough to at least temporarily remove the downward pressure. Reminder: bond prices and yields move inversely. Just as the beach ball overshoots the surface, so have yields overrun what we feel is a more natural equilibrium. What drives this view? 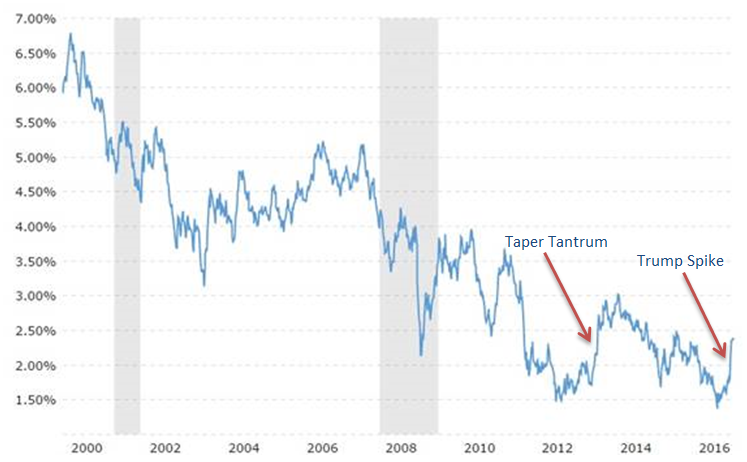 Although bonds are now pricing in higher future levels of inflation, we just don’t see it: Trump policy (on paper) appears to be stimulative and tax cuts could drive growth, but inflation has not moved higher through years of quantitative easing and policies. Offsetting any near-term inflationary influences are many deflationary forces at work in the global economy: namely, a stronger dollar, anemic productivity growth, and many commodity prices that are stagnating at multi-year lows. In a yield-starved world, U.S. bonds at current yields look downright tasty: Non-U.S. investors curtailed their purchases of our bonds because the cost to hedge currency fluctuations rose to levels that made these purchases economically impractical to foreign investors. Hedging costs have since come down. For instance, Europeans can profit from purchasing our 10-year bonds at a 2.45%, as opposed to German 10-year bonds at a paltry 0.38%. More buyers equal higher bond prices and lower yields. Although the Fed looks set to increase short term rates this month, this alone will not cause a sustained rise in yields across all maturities: We know the Fed wants to start normalizing short-term rates and they’ve also said they will lean toward allowing inflation to run hotter than normal. The last thing they want to do is get in the way of an economic recovery. They are aware that at a certain level, rates will start to slow the wheels of progress. This doesn’t mean that yields can’t go higher. Often times, the market overshoots. Rather than trying to time yields, our clients hold laddered bond portfolios, which have always been measured on a yield to maturity basis. As bond prices go up, we remind clients that the performance looks good on reports, but that we really want to see yields go higher – to increase cash flow/dollar invested. Rest assured that if yields stay where they are or go higher, your laddered bond portfolio will benefit in the medium term. It doesn’t take too long for the magic of the ladder to bear fruit. As the lowest yielding, shorter maturity bonds get replaced with higher yielding bonds, the overall portfolio yield to maturity ratchets up quickly and buffers lower bond prices. Regardless of the yield environment, we expect bonds to continue to offer downside protection and inverse correlation with stock prices, making them vital portfolio risk mitigation and rebalancing ingredients. As the media dramatizes this recent move in bonds as the ‘End of the Bond Bull Market’ and retail investors sell out of bond funds, we remain disciplined. Perhaps we should thank the media for stirring the pot and allowing our clients to purchase high quality bonds for much cheaper prices. In ladder we trust! As always, if you have questions or want to discuss your portfolio in more detail, please reach out. We enjoy hearing from you.